and Pipe Organs in Rockland County. and is expected to extend through 2015. The 2014 series will take place in the town of Ramapo, and it has been made possible in part by a generous contribution from the Town of Ramapo. The June 7 day trip begins at Rhodes North Tavern at 8:45am and ends after lunch (approximately 2pm). 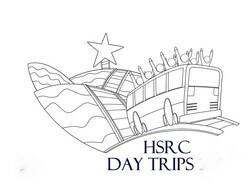 Trip fee is $69 per person, and $64 per person for members of the HSRC and includes bus transportation, guided tours and a delicious lunch. Space is limited and pre-paid reservations are required. The June 7 trip is a registered Path through History event. For more information about the Path through History program, click on the logo above. We will tour by bus, several of Ramapo’s historic cemeteries including Brick Church, West Ramapo, Iron Works, Rock. Co. & Veterans, Potters Field and Masonicus. A knowledgeable guide will board our bus at each stop, presenting the history of each cemetery. In addition we will learn about some notable people buried at each cemetery. Although we will be disembarking at 2 or 3 cemeteries, these stops will NOT involve a lot of walking. Our day will conclude with a buffet luncheon at Characters Restaurant. Our bus tour will travel to sites of several of Ramapo’s most historic and well-known pipe organs including The Lafayette Theatre. We will experience these majestic instruments as their organists present classical, sacred and popular selections. Our tour ends with lunch at Marcello Ristorante in Suffern. Or .... To reserve seats on the fall trips (Historic Cemeteries and The Pipe Organs), download the PDF brochure below and return its registration form, with payment, to the above address. For additional information, call us at (845) 634-9629 or e-mail info@RocklandHistory.org.